Ancient megalithic stones cut with astonishing precision. Mysterious sculptures depicting beings from around the world… and beyond. There are all the races present here, even the grey aliens! And legends of other worldly giants creating an entire civilization in a single night. 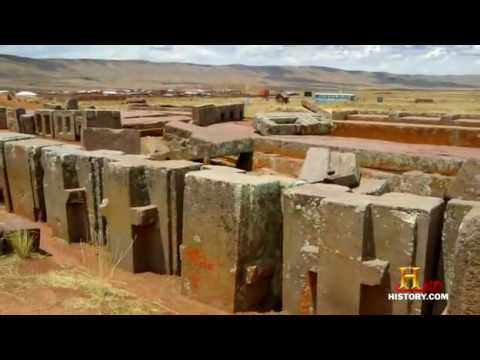 Today again is an amazing documentary of the More 2 History channel about ancient aliens and the site of Puma Punku Bolivia. If there is one place that shows evidence of ancient aliens, it’s Puma Punku Bolivia. Are the ancient ruins of Puma Punku the result of primitive men’s incredible ingenuity or are they the products of much higher power? Puma Punku is the only site on planet earth that in my opinion was built directly by extra-terrestrials. Pumapunku also called “Puma Pumku” or “Puma Puncu”, is part of a large temple complex or monument group that is part of the Tiwanaku Site near Tiwanaku, Bolivia. Tiwanaku is significant in Incan traditions because it is believed to be the site where the world was created. 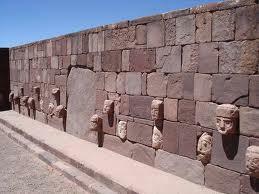 In Aymara, Puma Punku’s name means “The Door of the Puma”. The Pumapunku complex consists of an unwalled western court, a central unwalled esplanade, a terraced platform mound that is faced with megalithic stone, and a walled eastern court. I hope you enjoyed this post about Puma Punku Bolivia.